I’ve been at the numbers again. 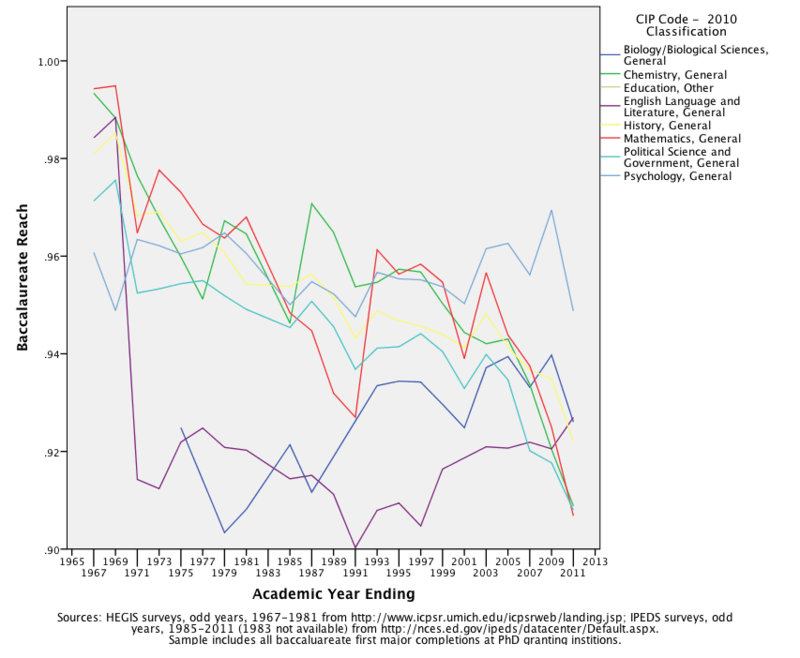 Last summer, we heard a lot about the share of degrees the humanities had lost (crisis!) and weighed in among the voices of reason (not so much a crisis as interesting times). Now, I write to propose the concept of reach as a necessary compliment to measures of share. In this, I want to tack against the prevailing wind, which urges us to regroup by imagining the humanities as an ancient unity. An idealized past will not help us navigate our current institutions, which have been profoundly shaped by the proliferation of distinct instructional programs. In this particular, as in others we have noted, the American research university has more in common with twentieth-century mass media than it does with Plato’s Akedemia or Humboldt’s Universität. If we must concern ourselves with share, it makes sense also to borrow sibling concepts that are regularly used to measure media audiences. These include reach. This effort has been partly inspired by Ben Schmidt, who has recently published an informative interactive visualization of degree share. Schmidt’s graph encourages us to ask questions about the actual and potential audience for degree programs that other presentations of such data typically discourage. 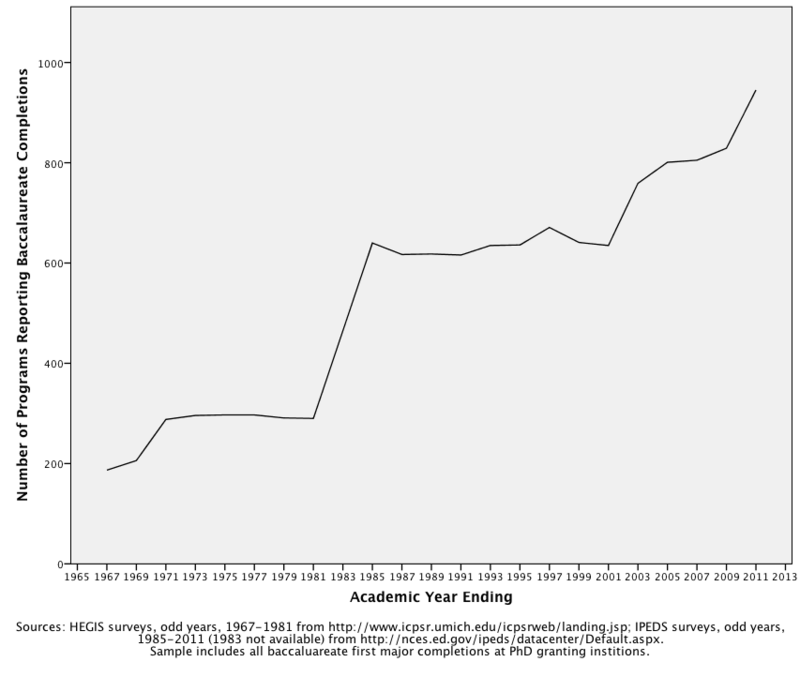 It allows one to see how particular degrees are gendered and how this has changed (or not) over time. It also allows one to choose several different metrics for degree share. One can look at the most common measure of share–percent of all baccalaureate degrees completed–but one can also view degree completions as a percentage of all 23 year olds. The latter measure is relevant because not completing a degree is also an option. If we are interested in what higher education does for our society, Schmidt argues here, we might more reasonably care about the proportion of young people receiving particular types of degrees than the proportion of baccalaureate degree earners choosing one professional path as opposed to some other. Whether employment or civic life concerns us, it is ultimately more important what proportion of adults have training X than what percentage of recent graduates do. On the other hand, if our concern is the narrower one of where dollars flow (or should flow) on campus, then to focus on share of completions makes some sense. This measure construes the “market” as students who will complete some program of study and encourages us to think of different degrees as competing for their attention. While I’m sure that everyone involved in higher education would profess the loftier goal of enrolling more students so as to educate as many young adults as possible, I think that most of us would also have to admit concern with the narrower question of whether the instructional programs we care about can grow in challenging times by competing for students likely to finish. Share of completions could be likened to television “Channel Share”: “the share one channel has of all viewing for particular time period . . . calculated by dividing the channel’s average audience by the average audience of all channels.” As the Nielson glossary from which I’ve pulled these quotations points out, channel share “is held in higher esteem by networks than media buyers on a day to day basis and is only referred to by the latter group when apportioning budgets and evaluating a programme for sponsorship.” Broadcasters care about how particular channels fare relative to each other. Advertisers care more about the proportion of a given demographic they can reach. Although it seems obvious to note, it bears underscoring that decisions made in aggregating data to calculate “share” complicate the conclusions one might draw from that measure. True to form, Schmidt’s graph groups many hundreds of individual degree programs into a relatively small set of disciplinary areas with labels like “Art/Architecture,” “English and Literature,” “Life Sciences,” and “Social Service Professions.” No one actually majors in “Life Sciences,” for example, but rather in one of the score of individual degree programs contained in that category. These majors likely compete for enrollments with each other more keenly than they do with degree programs in “Art/Architecture.” Therefore, if one wants to understand which majors actually are attracting the attention of students likely to complete, the aggregate measure is not granular enough. Why aggregate then? The issue is only partly one of legibility (clever graphic design could probably do something with the visual mush produced by plotting many hundreds of distinct degrees in a single time-series). Aggregation also smooths over problems created by variations in reporting and changes to the taxonomy over time. For example, it has for decades been possible to record degrees specifically in “Creative Writing” (23.1302), but programs offering creative writing as a track within an English degree will likely report those completions under 23.0101, the code for instructional programs in “English Language and Literatures, General.” Any given completion in 23.0101 might therefore represent degree work equivalent to a completion in 23.1302. Lumping together all completions in CIP family 23 sidesteps this issue. It won’t distinguish literature from creative writing degrees, but it also doesn’t introduce distinctions where there may be no difference. Shifting distinctions present a related problem. Using a taxonomy that preceded CIP, the 1967-1969 HEGIS surveys record completions of business degrees in “Real Estate/Insurance,” for instance, but subsequent surveys define separate programs in “Real Estate” and “Insurance.” Or consider “Motion Picture Technology” introduced in the 1985 schema as CIP 10.0102. The degree has no precise match in the current (2010) schema, but CIP 10.0201, “Photographic and Film/Video Technology/Technician and Assistant” comes close. Aggregation obviates these “problems” of consistent measure. Such problematic inconsistencies in the taxonomy used to track completions are precisely what should interest us. In fact, they should probably interest us more than the “share” question, because they help us understand the institutional terrain generated by ever increasing specialization within the research university. The raw numbers tell part of the story. 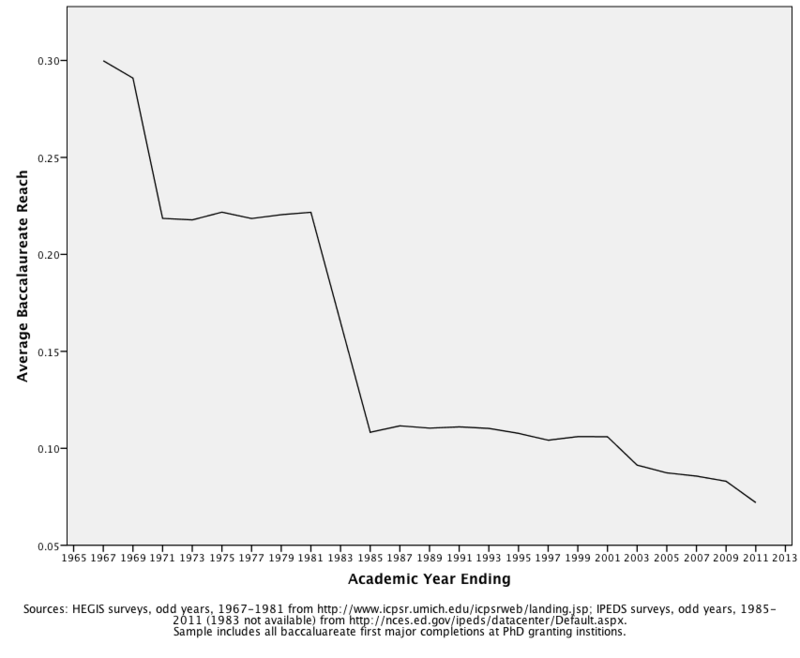 At “research universities” broadly defined (see note), the 1967 HEGIS survey recorded awards in 187 distinct programs, whereas the 2011 IPEDS survey (its successor) recorded awards in 829 different fields. This dramatic increase in the number and variety of offerings disappears in time-series of aggregate degree share. But increase is not the only story. Distinct degrees turn out to be very unevenly distributed across our institutions. How unevenly may be seen if we think about reach in addition to share. In broadcast industries, “reach” is the percentage of a total target audience (for example, Households Using Television [HUT] or People Using Television [PUT]) exposed to programing at least once during a given period. Again, instructional programs differ from television programs in many ways–not least, in their duration. One could say, however, that the total number of baccalaureate completions provides a fair measure of the broad target audience (as share of completions numbers assume). As with cable television packages, there is great variety in the set of instructional programs on offer to students at any given institution. No single institution offers all the programs listed in the taxonomy. “Reach,” then, measures the percentage of students who could have chosen to finish a given program, because it was available at their institutions. The number of potential students can be found by calculating the aggregate sum of completions at institutions awarding degrees in a given CIP. To arrive at reach, we divide this number by the aggregate sum of all completions. Running the numbers for odd years from 1967 to 2011, one is immediately struck by the fact that average baccalaureate reach is very low. After 1985, it was 1% or less. That is to say, the vast majority of instructional programs have been available only to a very small proportion of students completing baccalaureate degrees at institutions offering PhDs (my sample). As one would expect, this trend correlates with changes to the taxonomy that made it possible to record a greater variety of degrees. This graph shows the number of distinct programs in which baccalaureate completions were recorded. The jumps in this chart line up with the plunges in reach. It seems that elaboration of HEGIS codes after 1970 was decisive, as was the introduction of the CIP schema in 1985. Revisions in 1990, 2000, and 2010 had a less dramatic, but still discernible effect. All of these revisions expanded the “menu” of degrees from which institutions could chose to record completions. (It’s worth noting, too, that several different flavors of “other” have always been on offer). Whereas most majors reached few potential degree winners, a handful of programs reached almost all of them. Only seven programs maintained a reach of more than 90% for the entire period, with an eighth, Biology/Biological Sciences, General leaping from the 9th percentile into the 10th in 1975 and then holding ground. In other words, whether you went to a small and specialized PhD granting institution or a gigantic university, you could expect to find someone majoring in one of these degrees. These eight degrees, one might say, are the basic cable channels of higher education. The fluctuations in reach are interesting, particularly when held up next to changes in the taxonomy, and someone much better at stats than I could probably figure out what proportion of these gains or losses could be attributed to taxonomic changes. The sharp drop in English from 1969 to 1971 clearly seems related to changes in the scheme, for example, but the decline of History presents a less clear-cut case. The main point, however, should be that for all practical purposes these degrees–and only these degrees, out of the more than 800 baccalaureate programs currently tracked–can be regarded as ubiquitous. This list suggests that institutional specialization explains the low average reach phenomenon. A hypothesis would be that institutions are trying to distinguish themselves from one another by “niche marketing” more specialized degrees. Some of these degrees (like Art Therapy or Library and Information Science) seem like graduate degrees offered at the undergraduate level, which might support the niche marketing hypothesis. Other programs, like Forensic Chemistry and Japanese Studies, look like they might be programmatic emphases more broadly available but often recorded, respectively, under Chemistry, General or East Asian Studies (which in 2011 had a respectable 10.9% reach). Here, the low average reach number could be indicating a pervasive dynamic of specialization not otherwise captured in the data. In either case, the reach number adds a level of complexity to the notion of student audience that measures of share typically erase. If the reach measure can reveal institutional realities occluded by share, it can also provide a different vantage on the trends share identifies. It is common, for example, to equate degree share with “popularity.” But a different way to consider what’s hot and what’s not might be to look for which programs are expanding or narrowing their reach. It seems to me (and here I must confess that I am an enthusiastic, but almost entirely self-educated “statistician”) that one could get a rough sense of this by looking at the standard deviation of the reach of particular majors (CIPs) over the time period. Greater than average standard deviation would mean that a particular program’s reach is changing faster than the norm. Some of the highest standard deviations of reach can be found in degrees where specialization has overtaken more general approaches. 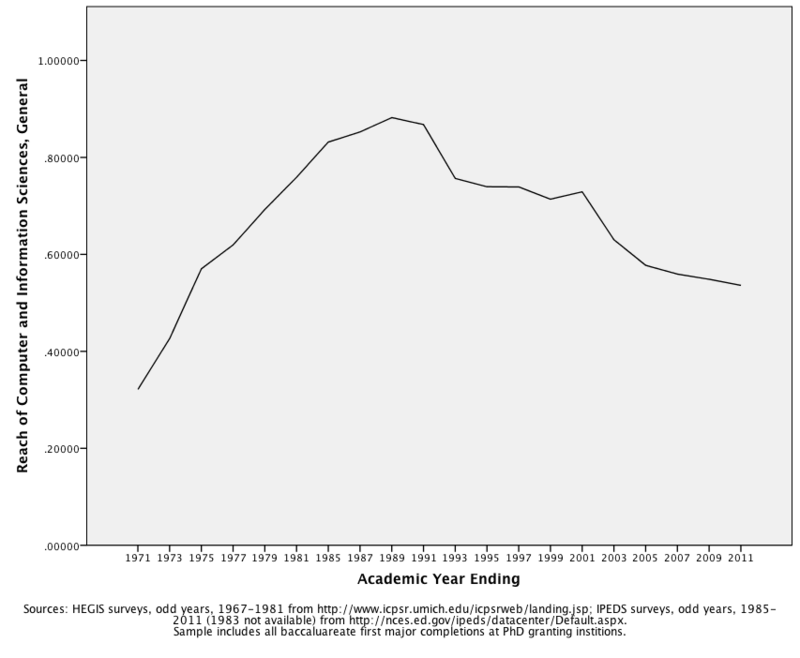 For example, “Social Sciences, General” has seen its reach plummet from 70% in 1967 to 25% in 2011 (with a standard deviation well above the mean). “Sociology,” meanwhile, had a reach of over 87% in 2011 (with a standard deviation well below the mean). We know what’s going on here, right? Fewer institutions, and particularly fewer large universities, are offering the more general degree. Other instances of relatively high standard deviation of reach pose different puzzles. What to make of the relationship between Computer and Information Sciences, General (11.0101) and Computer Science (11.0701)? Both have relatively high standard deviations, but for obviously different reasons. 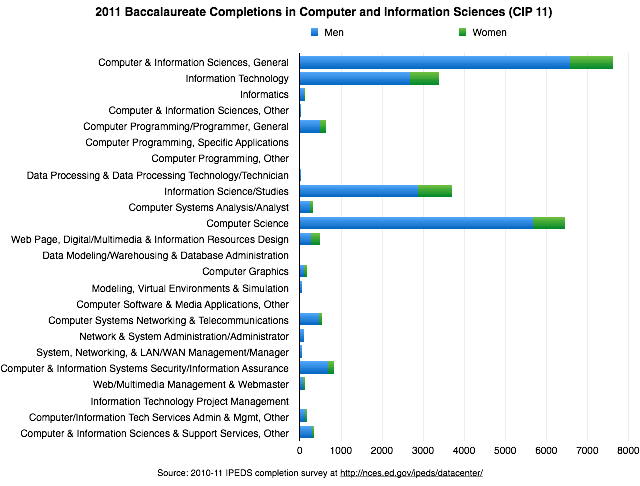 Interestingly, the 2011 group does include a majority female degree program, Data Modeling/Warehousing and Database Administration (11.0802), first identified in the 2000 CIP revision, which had a respectable 2% reach in 2011, although the total number of actual majors is too small to show up at this scale. What stands out is the boom in Computer Science (11.0701), created in the 1990 CIP revision, which in 2011 had a 46% reach (.54% share) and was one of the majors in which women were least well represented. Schmidt’s graphs reveal a “field” (i.e., an aggregation of degree programs) that has masculinized itself over the past decades and thereby limited its growth potential. The reach numbers add specificity and, along with it, a sense of the unevenness of this phenomenon. They suggest that the rapid proliferation of one flavor of “Computer and Information Sciences”–the flavor known as 11.0701, which is strongly gendered–might claim credit for the trend. Again, analysis by experts could test this hunch. But what of film and media studies, the discipline I’m always yammering on about? In a previous post, I established that some degree programs faculty would probably identify as “film and media studies” are reported under 09.0102 “Mass Communications/Media Studies,” while others are reported under 50.0601 “Film/Cinema/Video Studies.” Still others, particularly at the undergraduate level, may be reported under 23.0101 “English Language and Literatures, General.” Both 09.0102 and 50.0601 were introduced in the 1985 CIP taxonomy, which followed a couple decades of growth in film studies not captured in this data. Mass Communications/Media Studies expanded its reach the fastest, growing from from .1% (negligible share) in 1985 to 18.6% (.56% share) in 2011. Film/Cinema/Video Studies extended its reach from 5.8% (.04% share) to 20.9% (.21% share) of baccalaureate first major completions in that same period. Both exceed the mean standard deviation of reach. Basic cable channel English (23.0101) was far more steady. Its 2011 reach (92.69%) far exceeds the cumulative reach of 09.0102 and 50.0601 (almost 40% of graduating students), and its share–2.5% of all completions in my sample–reflects that much greater reach. Film and media studies’ relatively small share is unlikely to appear on any graph, except as part of one or several aggregations. If reach and share are both considered, it is not perhaps the fastest mover, but it certainly looks like a growth enterprise. In summary, then, we need to think again about what the specialization and differentiation of fields has meant for postsecondary education. In the 1960s, Clark Kerr mulled the possibilities (and difficulties) of a research university that no longer had a singular mission or core set of concerns. Today, we are faced with a sector that has for decades proliferated such a wide range of degree programs in such an uneven distribution that it is unreasonable to assume that even very large and well established universities look like each other. This need not mean, however, that we are faced with a choice between (1) strictly local analysis of our home institutions and (2) national share numbers that erase meaningful differences. Measures of reach can help us to assess diversity. They ofter a resource not only for increasingly data-driven debates about investments and outcomes, but also for understanding the kinds of campuses we inhabit and therefore for imagining the kinds of campuses we might hope to inhabit in the future. Note: “Research university” is not a category consistently available in the data. The current IPEDS survey offers various ways to specify institutional type, including Carnegie classifications. Using current data to classify institutions throughout the period 1967-2011, however, would obviate changes to an institution’s categorization and make it difficult to include completions at institutions that have closed. 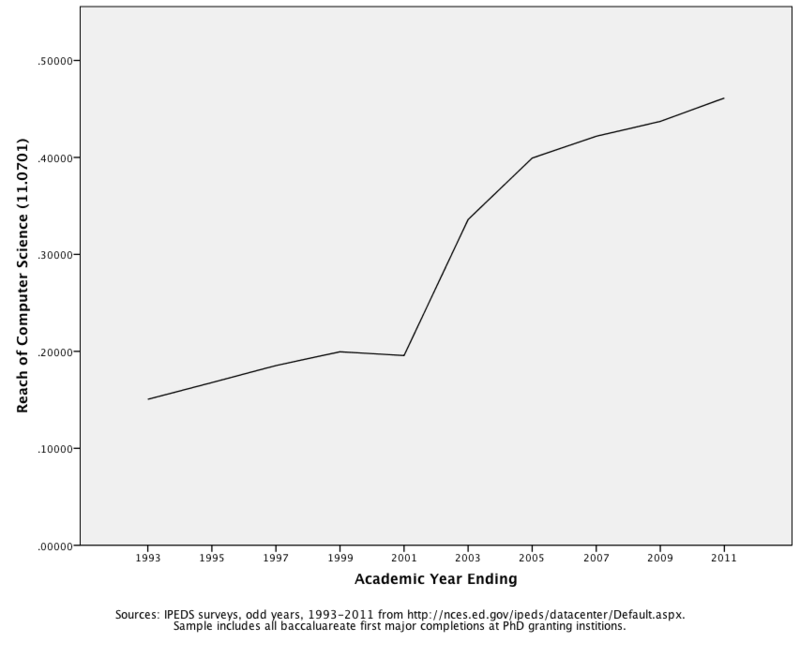 I have therefore focused my analysis on first major baccalaureate completions at institutions also offering the PhD, as that information is available for all years in my sample: odd years from 1967 through 2011, excluding 1983, for which no data is available. These institutions are arguably all “university like,” although some of them are very small and offer few degrees while others are huge public multiversities. This entry was posted in Statistical measures, Working With and Within the Culture Industries on June 10, 2014 by mark.